Canadian Rustic Ponies originated in Canada, particularly the Saskatchewan and Manitoba provinces. They were developed by Dr. Peter Neifeld of Manitoba, Canada. They were developed by crossing Heck horses from the Atlanta Zoo in Atlanta, Georgia with Arabian horse-Welsh pony crosses. On January 23, 1989, the Canadian Rustic Pony Association was formed, incorporated under the new Canadian federal Animal Pedigree Act, also known as Bill C-67. Prior to this, since 1978, Canadian Rustic Ponies had been registered through a registry based in the United States, and as of September 1989, 72 ponies had been US-registered. These ponies were eligible to become double-registered under the Canadian and US registries, and many did so. 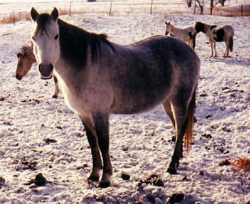 No ponies were found outside of Manitoba and Saskatchewan provinces as of September 1989, but this was expected to change as more breeders became aware of the new breed. These ponies stand 12.2 and 13.2 hands (50 to 54 inches, 127 to 137 cm) high. They can be gray, buckskin or bay, have primitive markings such as dorsal stripes and zebra stripes, and have partially raised manes and full flowing tails. The facial profile is straight or slightly dished, with a prominent jaw. The neck is thick but arched the girth and shoulders thick, and the croup slightly sloping. The legs are strong, and the ponies are said to move fluidly, especially at the trot. They are highly intelligent, easy to train, willing to please, extremely hardy, exceptionally fast in their gaits, and have excellent endurance. The Canadian Rustic Pony is used mainly for jumping, driving, or family pets.